As the cold of winter sets in and the barrenness of the trees outside my window becomes a little starker, it is easy to forget the powerful transformation nature is effecting beneath our feet, just out of view. The earth is rejuvenating through much needed rest, and seeds concealed within it are undergoing invisible preparation for what will appear to be a sudden miracle come springtime. The seemingly infertile freeze of winter masks what is actually the greatest breeding ground for quiet potential. Unseen processes can yield remarkable, lifegiving growth. The mad rush of year-end campaigns, budget planning and goal setting that typifies December in the philanthropic and nonprofit world is now behind us. We may be tempted to do a little digging out and then settle back into our old routines. But that would be tragic. The relative calm of this beginning is no time for business as usual. The calendar’s fresh start holds endless potential. In the quiet of the new year, we have the ability to make seemingly mundane procedural improvements that can potentiate radical improvement that will come to fruition in months and years to come. This powerful, hidden growth can sometimes be the most powerful kind of growth there is. We often hear about growth in numbers — numbers of dollars, numbers of meeting attendees, numbers of people affected by the programs we fund or run. But the subtler growth I’m talking about comes from the kind of internal stabilizing and strengthening that happens when nonprofit professionals reevaluate and adjust the systems and processes by which we perform our daily work. This nurtures our abilities and strengths in ways that may not be immediately obvious, but ultimately causes massive shifts enabling outcomes we may otherwise only dream of. An ethos that guides our foundation is that we constantly strive to learn and grow. Though many of our annual goals are linked to measurable outputs, I am convinced that the most important goals we have are those that relate to ongoing internal process improvement. It is through these subtle, sometimes incremental, changes that we fulfill the wise words of my 9th grade science teacher, who wrote me a note on the last day of school saying “Leaps forward are made through little disciplined steps along the way.” And so it is with organizational growth: Our ultimate impact is governed not by our growth in numbers, but by our growth in capability. As the sun sets on 5777 and final preparations for Rosh Hashanah 5778 are tended to, our attention turns in earnest to the inner work of the coming days and the outlook for the coming year. It is so tempting to use this time of reflection to make a new laundry list of things to work on, new years resolutions as it were. But we know that tiny bits of progress in a multitude of pursuits leaves us feeling empty and accomplishing little. How can we do less and accomplish more in the coming year? What should we be most focused on? What does the world need most from you right now? What is the single biggest contribution you can make to humanity? To the Jewish people? To your community? To your family? To yourself? To your body? Your mind? Your soul? What does G_d want from you above all? These are questions worth asking over the coming two days of Rosh Hashanah. For me there is a certain tension between my choice to observe the halachic prohibition against writing during the holidays and my commitment to use the time for personal introspection in service of repentance, renewal and growth. My own approach to the kind of introspective work called for during this season of renewal and repentance almost always includes lots of journal writing as well as prayer and meditation. How can I do the introspective work of Rosh Hashanah without pen and paper in hand? Is the holiday one thing and personal growth another or can traditional Judaism play an integral role in personal growth in an integrated way? In an age where halacha, Jewish law, is often viewed as anachronistic or irrelevant, I choose to follow it to the best of my ability because I believe in my heart that it matters. Sadly, halacha can at times be observed by rote and become separated from its meaning and deepest value. But uninspired practice is not an indictment of the wisdom of the practice itself. I find that despite my internal resistance, the specific disciplines of halacha, when observed with deliberate intention, often help channel my exertion of effort toward personal and communal growth. Perhaps this Rosh Hashanah can be such an occasion. My plan for the coming two day holiday is use my time in synagogue to engage in prayer (formal and informal), reading of inspiring material and personal reflection and meditation. Since I won’t be journaling, I’ll have to listen carefully for a common, overarching themes rather than a long list of fixes and resolutions. As I review mentally the past year and rethink my values and priorities, I’ll be opening my ears to G_d, listening for a phrase rather than an essay. Maybe just maybe, I’ll emerge from the process with a singular, simple principle that I can concentrate on in all areas of my life in the coming year. May it be a year of growth, depth and truth for us all. I recently found this piece of writing in my journal from 2010. At the time I had just started Do More Mission and was experimenting with working all over DC metro from my bicycle. Laptop and cell phone in tow, I worked my way around various parts of the city, Rock Creek Park, the burbs, etc., stopping for 30-90 minutes at a time to work in the woods, in urban parks, at coffee shops, on street corners, benches and grassy fields. It was surprisingly productive and utterly exhilarating. This approach went by the wayside as a team began to emerge around me and the gravitational pull of “the office” got stronger. While physical proximity is important, the sheer physicality and spontaneity of this approach was incredible. I think I’ll book a day of working from my bicycle again sometime this fall. Have a great weekend, all! 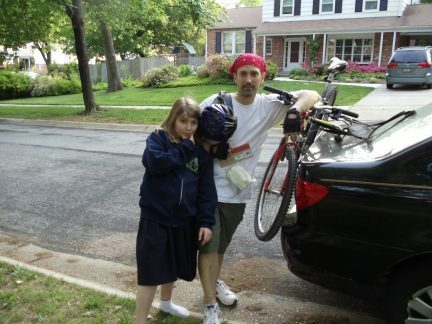 From Monday 9/13/2010: I so love riding my bicycle, a passport out of sedentary life. I hop on and within seconds my heart is pumping, my respiration on the rise and my leg muscles cranking. Even my upper body gets its share. I am rocked out of mental slumber and into conscious, alert attention. I am awake. Before long I’m moving at a speed that makes for a certain safety risk. The cars, the curbs, the protruding roots, the potholes, the gravel, the rocks. All these wonderfully looming assailants give thrill! Be it a country or a city riding day, there are always dangerous things to be aware of. So many things at once popping up without notice. How glorious it is to finally have a productive use for this busy brain of mine! While cranking along in this dangerous domain, having attention everywhere all at once is decidedly an asset. What in other contexts would be called “attention deficit” is suddenly a valuable survival skill. With body and mind fully occupied, my soul can finally relax. I am clear. I become aware that my movement forward is propelled by a unique partnership between my own physical exertion and this very specialized machine. The modern bicycle may be sophisticated in the design and engineering that guided its evolution, but it’s operation is so simpe that it seems almost primal in our microchip and genome moment in history. At a time when the world seems split between those who worship science at the expense of beauty and those who scorn progress at the expense of true soul, this bicycle is my refuge. It is both machine and nature, modern and authentic, powerful and simple. Today I am neither overly dependent on technology nor pretending to be self-reliant. Partnering with this simple, brilliant machine, I am participating.